INbolnet - Provisional standings, Jorge Lorenzo again testing the new Yamaha chassis on the first day of MotoGP testing at Aragon, Spain, Tuesday (4/9). He recorded the second fastest time behind Dani Pedrosa. Early versions motorcycle YZR-M1 2013 is already been tried in pilot Republic last week. Lorenzo was hoping the latest chassis that can be used to race before the season ends. To that end, the chassis must immediately demonstrate better performance. 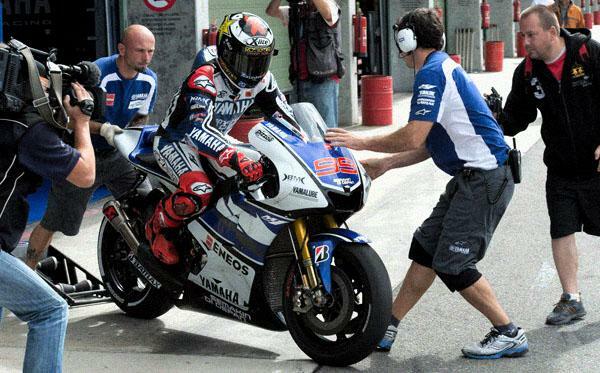 Lorenzo, who felt there was no positive effect of the chassis was in Czech, hesitated again at Aragon. "We tested the new chassis. Far, we have not been able to find the positives and negatives. We must continue to try and do more laps to understand," said Lorenzo. Spaniard also said it would try out the new YZR-M1 machine on the second day of trial. Lorenzo now has only five remaining machines. He lost an engine after being run over in the first corner Alvaro Bautista MotoGP Netherlands. "On the second day, we will try the new machine. Seems like this machine will give us a little extra power in a straight line. That's our weak point because it always lags 5 km / h from Dani. It is also lighter than me, so of course the engine drove more fast, "he concluded.